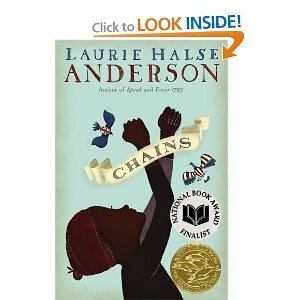 Chains (2008), by Laurie Halse Anderson, 300 pp. Hard to believe this is by the person who wrote Speak and Wintergirls, powerful novels about the challenges of modern life for young women. For this series, Anderson has shifted gears, creating a story of Isabel, a girl caught in the build-up to the American Revolution. Although she lives with a British Loyalist (a truly despicable woman), Isabel spies for the Americans, carrying messages all around New York (in those days, New York was just a triangle of land at the south end of the island, so “all around” encompasses a tiny area, easily traversed on foot). But here’s the catch: Isabel is a slave. As the white rebels fight for their freedom from British oppression, she has to wonder who’s really on her side. The rebels have no objection to slavery, and the British promise freedom for any slave who helps the Loyalists. It’s a tough decision, one she constantly revisits even as she puts herself in danger by carrying those messages. All the time, she chafes under the cruel treatment of her mistress. It’s Curzon, an enslaved young man, who convinces Isabel to help the rebels. Forge, the second book of the series (and the subject of tomorrow’s post) is told from his point of view. The third book, Ashes, will be released in 2014.